The eclipses are over, but they will continue to have a ripple effect for weeks and, in some cases, months. But at least we’re out of the inter-eclipse period, and the dust will start to settle. It may not feel like it early this week, though, as Mars in Gemini squares Saturn in Virgo. If you’re grumpy and slow, or if you encounter others who aren’t being very kind, chalk it up to these two, who in traditional astrology are the Big Meanies of the solar system. Actually, they called them malefics. They definitely put a crimp in my writing this weekend (Mars is transiting my fifth house). In modern astrology, we make allowances for grumpy old planets and try to find the good in them. If you’ve followed Neith, you know that she attributes lots of good qualities to Saturn. Likewise, Mars has a positive side. He rules muscles and blood, and when he’s behaving, you can get an energy boost and a strong dose of motivation. Just not when he’s square Saturn. On Thursday, Mars trines Jupiter in Aquarius, and it’s a whole different ballgame. You may feel an energy surge, and depending on where these planets are transiting your chart, you could feel motivated to move mountains. The Sun and Mars are moving in a close sextile, so the two of them are transiting the same set of planets, Mars by trine and the Sun by opposition. On Friday, the Sun in Leo opposes Jupiter. This is one of the “good” oppositions. It’s energy is cheerful and optimistic. On the downside, you might overestimate you capabilities and do something stupid. Think before you dash across five lanes of traffic to get a latte. Or before you tell your boss that you can get through all that paperwork by 5 p.m. in order to pick up the client at the airport and check out all the catering arrangements for dinner at 8. Over the weekend, Mars and the Sun both aspect Chiron. Normally, I would issue a cautionary note about this, but since we have to look at the chart as a whole, this is really about a Sun-Mars combination aspecting Neptune & Co. On the whole, I think this is conducive to deep healing that will clear the way for a leap in spiritual growth. But, as with all healing, sometimes you have to reopen a wound first, and Mars trine Chiron could do that. I don’t think it will be extremely painful, though, and the post-op recovery should go very fast. On Friday and Saturday, the Moon is in Gemini, where she’ll conjoin Mars and amplify his trine to Jupiter, Chiron, and Neptune. Again, I see this is as a healing balm, and since Gemini is an air sign, this combination of planets is conducive to greater understanding of what ails us. If you’re not yet aware of the repeat patterns in your life, spend some time alone this weekend in quiet meditation. For those who are having repeated “failures” in love, think about how each successive relationship contained the same pattern. Likewise, if you’ve had similar experiences every time you get a new job, think about the pattern and see if you can detect its underlying source. We’re on a fast track of expanded consciousness, and part of the process may be tearing down and reconstructing. That’s actually more Plutonian than anything happening this week, but it all goes into the same pot. Image: Bridge repair. 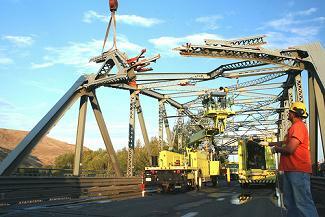 Washington State Department of Transportation workers repair a bridge over the Naches River after a collision. I like the symbolism here. Repairing internal structures after a collision. The delays and stops in traffic during repair. Bridges as our means of connection and communication. I’m sure you can think of more metaphors. Photo courtesy WSDOT. This entry was posted in About astrology, Forecasts and tagged eclipses, Jupiter-Chiron-Neptune, Mars, Saturn on August 10, 2009 by Pat. Boy, did we have a Mars sq Saturn incident today. We thought we had found a replacement pickup for my husband but the deal fell thru when the salesman drove it and found out the transmission was shot! My Aries is extremely frustrated . . . he DID NOT want to spend more time looking. Seems to me I read something about the Gemini-Sagittarius axis includes automobiles and this seems like a classic scenario for what happened. Sorry to hear about the pickup setback, Neith … but thank goodness the problem was discovered before you plunked the money down! I have been reassured several times over that Gemini/Sagittarius and houses 3/9 cover matters relating to automobiles. My late mother (Sun in Sag) expanded this to include “all gadgets.” According to her, no one loves their gadgets as much as a Sagittarius or a Gemini. no one loves their gadgets as much as a Sagittarius or a Gemini. LOL, KayKay! Now that you mention it, I’ve noticed that too. I have my nodal axis in Gemini-Sag and I love my computer. Can’t help but feel this is going to work out for the best. The Aries impatience can get in the way of good decision making sometimes, says Libra. I don’t like meanies. But I do like the feisty :)– they always have marshmallow middles. I’m one of the feisty ones. Grrrr. Frustrating day today. no one loves their gadgets as much as a Sagittarius or a Gemini. LOL! I concur! I have 3 planets in Gemini and a Sag Asc and I am a gadget queen. My friends come round and laugh at my iRobot vacuum cleaner! I’m feeling the mood pick up, but mostly still feeling the PTSD from the past weeks! Wow. I’m blown away by this post because looking back as the week unfolds, it is right on target. This was a tough week emotionally for me. I feel like I’m coming up to the surface of some murky waters, though. And it feels good. Glad to hear that, Mem. Thanks to everyone for all of your comments and feedback. Sorry that I seem to have disappeared off the face of the Earth. Past few weeks have been extremely rough and it’s all I can do to keep my head above water, murky or otherwise. The New Moon in Leo next week should lift spirits quite a bit, although it will be directly opposite Neptune & Co. Neith will have a full report tomorrow, so check back then. And I’ll be back with next week’s forecast on Monday morning. Hang in tight, Pat! Sending you good vibes your way!